I love the clip (am 'pinning' it to save it), and am looking forward to seeing your student results. 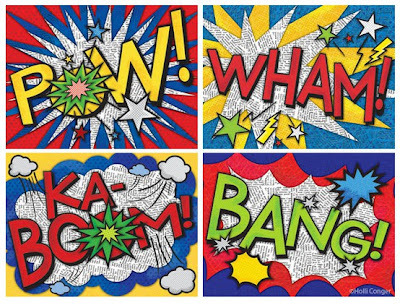 I've often done a Lichtenstein project w/my 2nd or 3rd graders, where we pick an action word (POW, BAM, ZAP, etc) and "do it up" Lichtenstein-style, first painting solid areas of just red, yellow, blue and then using a giant Q-tip or pencil eraser to add areas of dots. Then we outline w /black to complete. I think the kids would love seeing this video! I can't wait to see your finished artworks. I would love a copy of the slideshow... marcia@eagleschool.org. Thanks! Just found your blog. Very nice. I will add it to my blog roll. Thanks for the great resources here. I have a video that is funny for this project too. You should check it out! Love the wonderful idea! Love a copy of the slide show. This is fantastic! I would love your slideshow. I'd love a copy of your slideshow! Great project! Great project! May I have a copy of your slideshow? Thanks so much. I would like the slide show also, kholmes@m-ecs.org. I like the idea of using newspaper. What a great way for kids to WANT to use onomatopeoia! I'd love to see the slideshow! Archie comics came to my school for a workshop! It was great just blogged about it a few weeks ago! Its amazing how comics have such a great impact in the classroom! I'm your newest follower :) great blog.. Thanks so much for sharing! I'd love a copy of your slideshow! I would love a copy of your slideshow! This does look like something students would think was cool! Hi! I love this idea. Please send me a copy of your slideshow too. Thanks! I love, love, love this lesson. If not too much trouble could you please send me a copy of the slideshow? Thank you so much for sharing your creativity. I am teaching this week on this exact topic. I would LOVE your power point. Thanks for posting such a creative and FUN way to teach this. 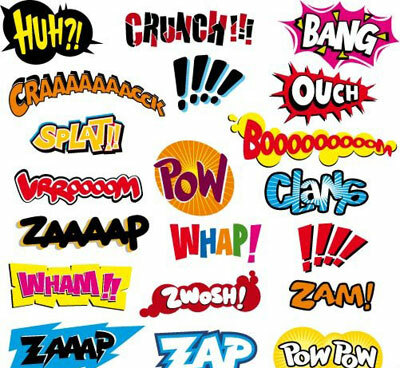 Thanks for sharing your great idea... we talk about Onomatopeoia but they still don't seem to get it. I am going to try your way! Thanks. If you would kindly share your power point I would be ever so grateful! Cool idea! I am passing it on to our art teacher. I just added a link to this from a writing post. Stop by if you want a chance to win an Amazon gift card! Just found your site and WOW! This is just what I was looking for. BLAM! was right there on your page with a great lesson for my Art students. Please send me your slidehsow if you can. I love combining art and writing..... this is just a cool way to start the year.